We were kindly sent some goodies from the lovely people at discovery foods to try. (You can visit their website which contains lots of recipe inspiration here - www.discoveryfoods.co.uk ) Now both myself and husband are calorie counting at the moment (as are most of the population I think!) so I challenged myself to make a meal that was under 700 kcals. 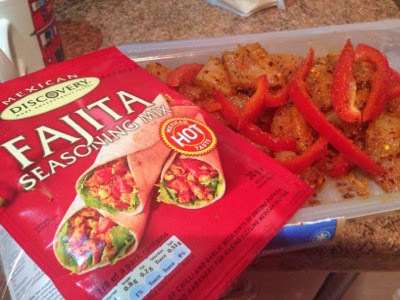 We diced 2 chicken breasts and a whole pepper and mixed with some 'hot' fajita seasoning and a teaspoon of olive oil. I left this in the fridge to infuse for approximately 30 minutes. The whole meal took about 10 minutes to put together. We simply fried the chicken and peppers for approximately 10-12 minutes and then popped in a bowl. We then microwaved our discovery wholemeal tortilla wraps (trying to be healthy you see) for about 20 seconds each. Now the tough part, we normally add A LOT of grated cheese to our fajitas as we make them up. We are easily talking half a pack each at times. We were disciplined though and weighed out just 30g of cheese each and placed in a ramekin on our plate. Be warned, 30g of grated cheese is hardly anything! Luckily, it turned out we didn't need any extra cheese after all as the chicken and peppers were so flavoursome and spicy. I love how you can choose from mild, medium or hot fajita seasoning. Something for everyone! I'm also happy to report that discovery hot seasoning is actually hot (sadly too often I find that something advertised as hot is in fact just mildly spicy - definitely not the case here). 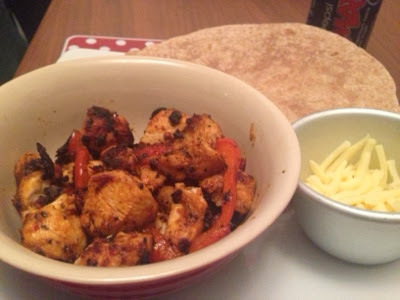 So, 1 breast of chicken, a tsp of olive oil, half a red pepper, 30g grated cheddar and 3 wholemeal fajitas was just under 700 calories. The meal was very satisfying and I'm hoping because the tortillas were wholemeal I will feel fuller for longer.